I made up some cookies yesterday. 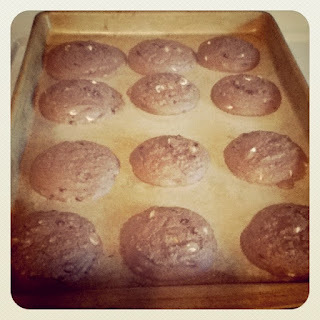 I followed the original Nestle Toll House Cookie Recipe. The only difference is that I had a little bit of cocoa left (about 1/3 cup) and added it. I also have a mix of white chocolate and butterscotch chips added with the chocolate chips. I also left out the nuts. The link to the recipe can also be found here. That recipe sure has become a classic in most homes. It's great that you customize it to suit your taste and what is on hand. Thank you for sharing your tip and recipe at Vintage Recipe Thursday. Amazingly easy and really looks delicious. I'm definitely craving for a plate of that right now. Thanks for sharing this wonderful recipe. This is definitely a must do recipe this weekend since I got my Alcohol Server Certification.